TL;DR: Photo used commercially without permission, SLCC doesn’t feel like paying for using my work. Normally, I don’t have a problem with my work being shared, since it features my watermark. However, they’d shared it from another site that had removed my watermark and replaced it with their own. To this, I must obviously object. I’ve had a conversation with iFunny, and reached an agreement with them for the violation of my copyright, based on the nature of what happened. 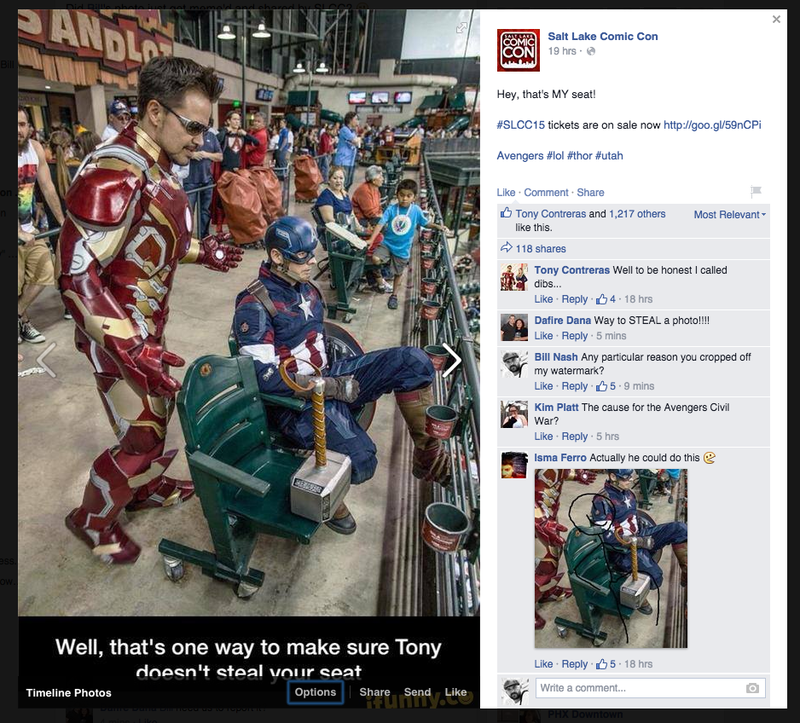 However, when SLCC shares viral photos on their page, they do it as part of a campaign to promote ticket sales for their convention. 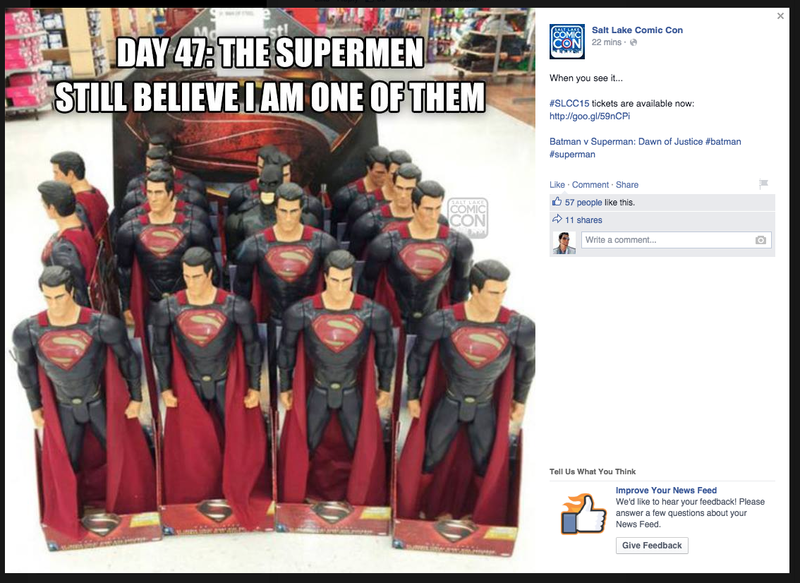 Most of the posts to SLCC’s Facebook page feature uploaded viral images from around the internet that target their particular fan base, and include hashtags and links to their web ticket sales. The ‘uploaded’ part is the key factor here, because it strips the original source of the image of any benefit of the traffic generated by the post, and SLCC becomes the primary benefactor as the new ‘source’ of the image. To this, I must object much louder, and I did so by filing a copyright complaint with Facebook, and sent SLCC an invoice for the unauthorized commercial use of my image. Nearly a month after my complaint, one of their fan coordinators has responded to let me know the image was removed, and apologized for my ‘frustration’, making no mention of my request for payment. After thirty days, the invoice has been left unsatisfied, because really, why should they pay it? They got the value they wanted from it, for free, and cast it aside when that value was lost to them as people who recognized my work and lack of attribution began tagging me in the posting. It’s hard enough to make money as a photographer without your work being casually used, and then cast aside with an ‘oops’ when the offenders are called out for it. Had I used SLCC’s copyrighted content or intellectual property, I have zero doubt that tactical lawyer attack squadrons would be circling my house in black helicopters, demanding blood or other valuables until I was left an empty husk of a man, utterly destroyed or otherwise incapable of ever committing another transgression. Ever. All jokes about lawyers aside, this is basic copyright law. You can’t take someone else’s work and use it to run your business. I would think that a large comic book convention, filled with artists and writers and other content producers, all representing and celebrating an industry these laws were written to protect, would not only understand this, but honor it. Update: Uh, good morning, Reddit. A two year old internet meme photo, to which they added their own watermark. I basically told the owner of SLCC that thieves don’t get to negotiate price, and he declined to pay my invoice. His stance (my words/interpretation) is that they’re happy to take images down if someone complains, but otherwise, they’ll continue to profit from the work of others as long as they don’t get caught. At the bottom of it all, it’s not about the money. I’ve already stated elsewhere that if he pays my invoice, I donate the proceeds to the charity that the two cosplayers in the photo represent. I’m otherwise enforcing my copyright, and the principle that I don’t like someone else profiting from my work, never mind being cavalier about doing it to dozens of other people. SLCC certainly isn’t a non-profit. Update: Salt Lake Comic Con made a generous donation to Comicare, this afternoon. I know it costs money, but this is when you take them to court. Maybe start a gofundme. Good for you . It burns me up when they do this to those trying to make a living. To your point, if it was the other way around they would be storming your house and killing your dog. The old hypocritical oath at work here: Do as I say, not as I do. What jackasses.